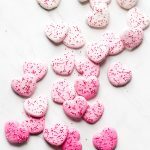 Pink & White Heart Circus Cookies are the cutest little chocolate coated shortbread cookies, perfect for Valentine’s Day. They taste even better than the Circus Animal Cookies you ate as a kid! 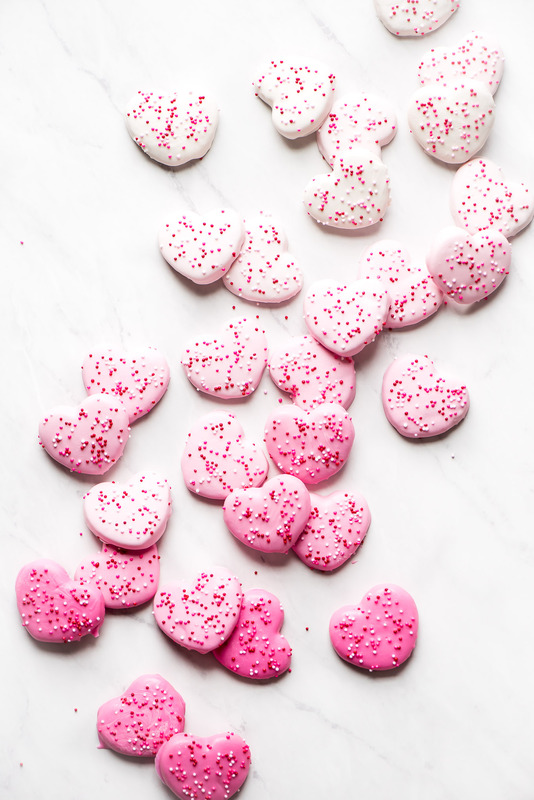 I love all the cute treats for Valentine’s Day like these Pink & White Heart Circus Cookies. 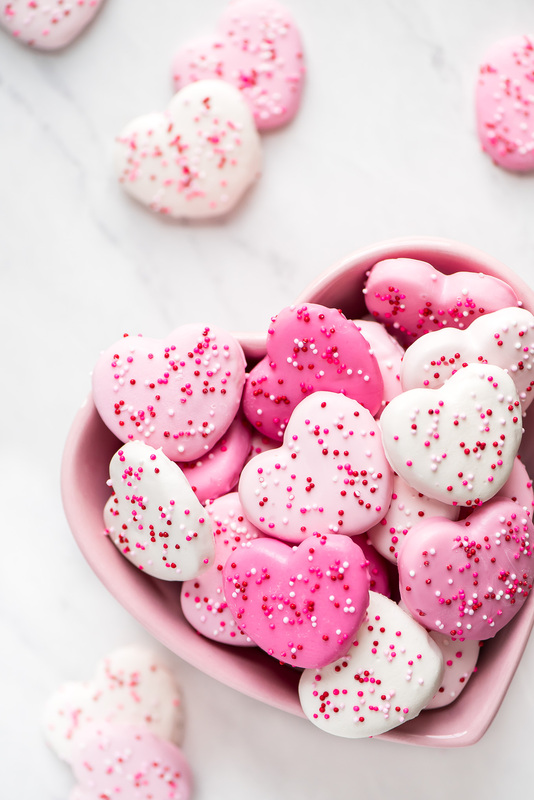 All things pink, hearts, chocolate… it just makes me happy! Did you eat Circus Animal Cookies as a kid? Well these little cookies taste just like them, but better since they’re fresh! 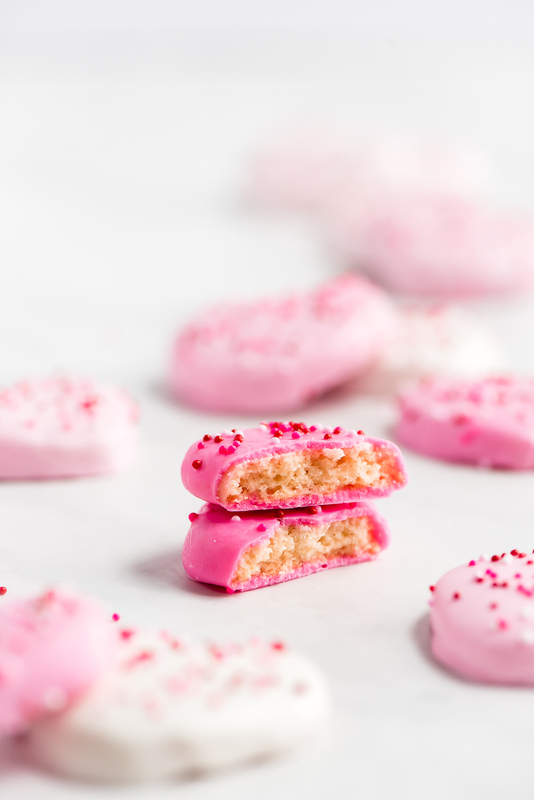 The Original Circus Animal Cookies by Mother’s are little shortbread cookies coated in a layer of pink or white chocolate and then decorated with colorful sprinkles. They were so good as a kid! You can still buy them but now you can make them even better and right in your own kitchen. 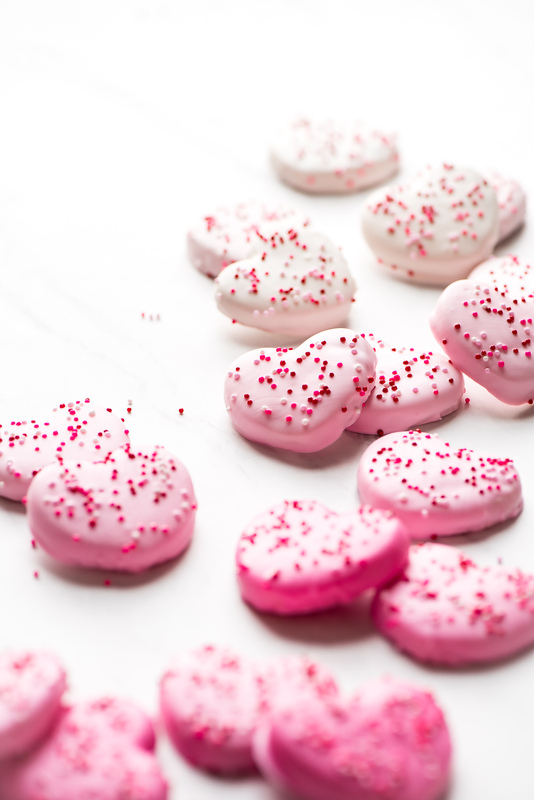 These Pink & White Circus Cookies are a fun spin for Valentine’s Day or really any day. Change up the shape and colors to fit any occasion or holiday. The first step is to make the dough which is just a basic shortbread cookie dough. Cream the butter and sugar, add the eggs and vanilla, and then mix in the dry ingredients. After the dough is made you’ll divide it in two and roll it out between parchment paper to 1/4 inch thick. Place the dough in the fridge for at least an hour so that it’s not too sticky to cut the shapes out. 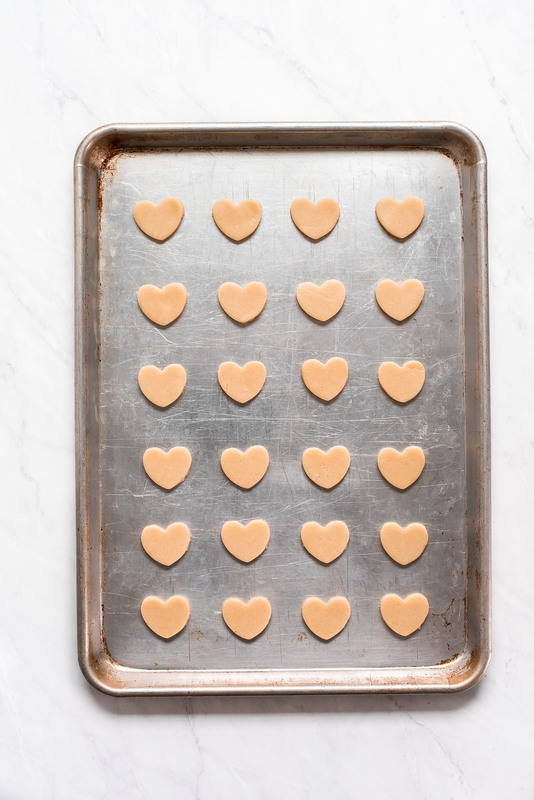 You’ll work with just one section of dough at a time, cutting out the hearts and then place them on a baking sheet 1 1/2 inches apart and bake at 350 degrees F. They only take 10 minutes. You’ll see that the edges of the bottom of the cookie just barely start to brown. The cookies need to cool completely before dipping into the chocolate. 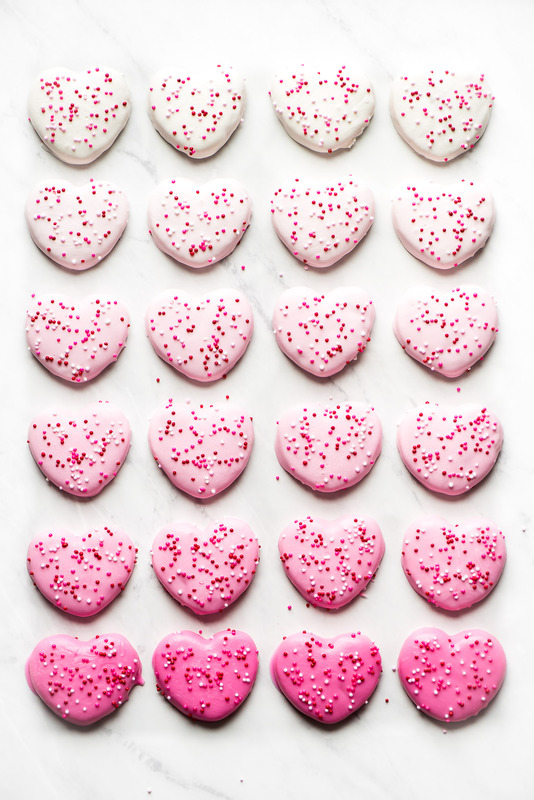 Circus cookies are usually just white or pink but I wanted to have a little fun so I divided the chocolates up so that I had various shades of pink. 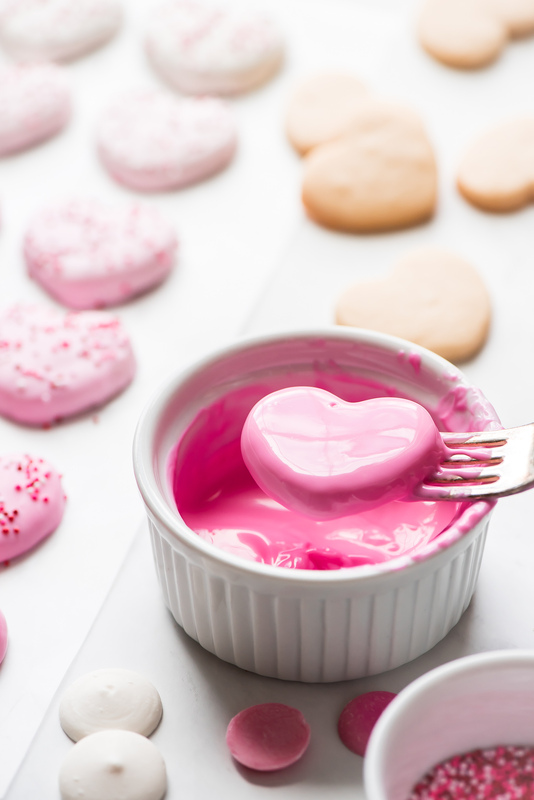 For the original look, work with just one color candy melt at a time. You’ll want to be sure to get melting wafers, not chocolate chips. Melt the wafers in a microwave safe bowl along with the coconut oil so that it has the proper consistency. 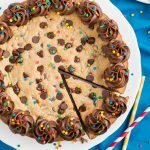 Drop a cookie in the chocolate upside down, flip with a fork, and then lift it out with the fork and give it a few taps on the side of the bowl. 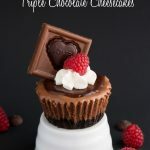 This makes the chocolate even out on top and gets off excess chocolate so it doesn’t pool around the cookie. Scrape the bottom of the fork and cookie against the edge of the bowl and then place on wax paper to set up. Immediately add the sprinkles and then repeat with the remaining cookies. 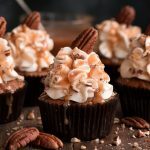 Let the chocolate set and then enjoy! How should I store Circus Cookies? Once the cookies are set, store in an airtight container for up to 2 weeks. They can also be frozen for up to 3 months. 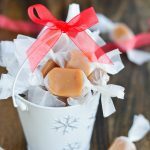 Wilton Candy Melts– I uses these all the time for dipping cookies, pretzels, truffles… You can usually find these at any craft store, Walmart, or Target. 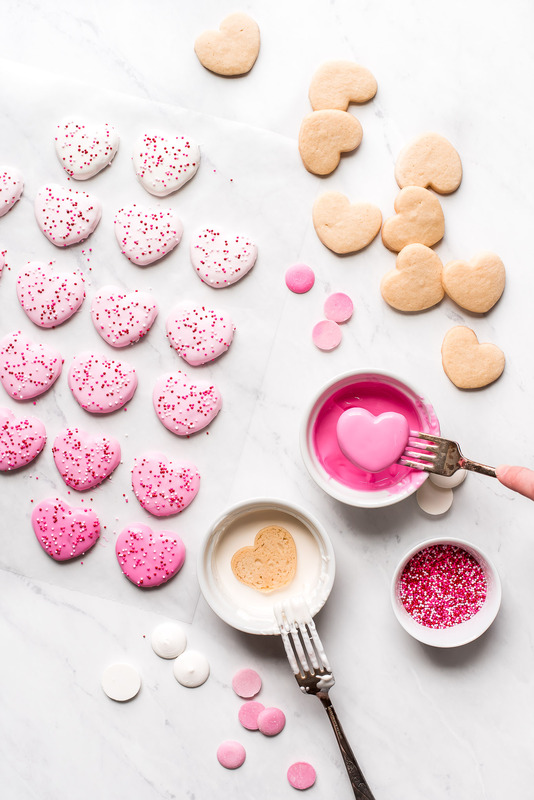 Pink & White Heart Circus Cookies are the cutest little chocolate coated shortbread cookies, perfect for Valentine's Day. They taste even better than the Circus Animal Cookies you ate as a kid! In a medium size mixing bowl, whisk together the flour, baking powder, and salt. Set aside. In the bowl of an electric stand mixer, fitted with the paddle attachment, cram butter and sugar together for 2-3 minutes on medium. Add in the egg and vanilla and mix until combined, scraping down sides as needed. Add the dry ingredients to the mixer and mix until combed. Divide dough in two. Place the dough onto one half of a large sheet of parchment paper and then fold the parchment paper up over the dough (the dough will be sandwiched bewteen the parchment paper. Press down on the parchment paper to flatten the dough a bit and then us a rolling pin and roll the dough to 1/4 inch thickness. Repeat with the remaining dough and another piece of parchment paper. Place the sheet sof dough in the fridge for at least 1 hour. Take one sheet of dough out of the fridge and peel the parchment paper off the top. 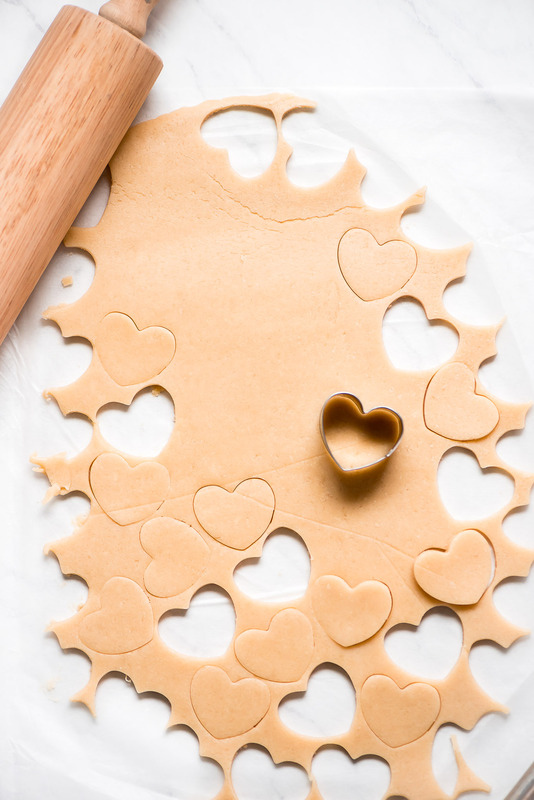 Cut out the cookies using a 1 1/2 to 2 inch heart shaped cookie cutter and place on an UN-greased pan about 1 1/2 inches apart. Bake for 10 minutes. You will barely start to see the bottom edges begin to turn a light brown. Let cookies cool on pan for 3 minutes and then place on a wire rack to cool completely. 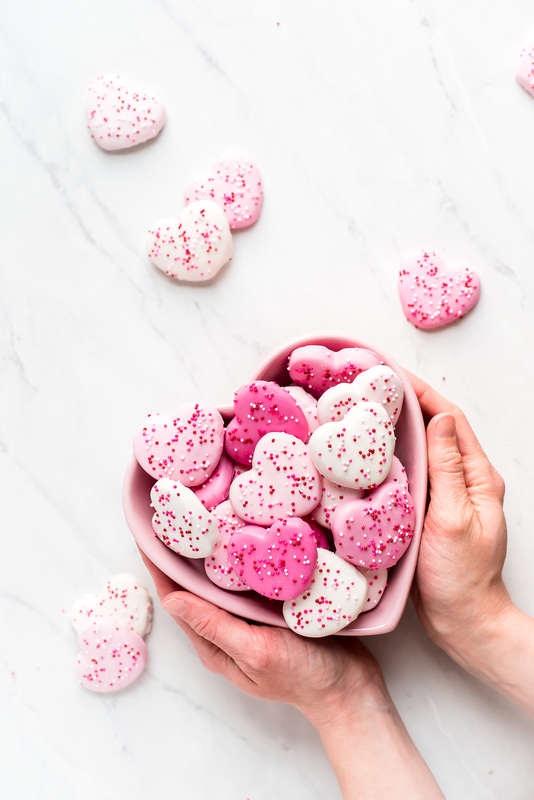 Place white melting wafers and 1/2 tablespoon coconut oil in a bowl and heat in the microwave on 50% power in 30 second increments, stirring between each, until smooth. Cover work surface with wax paper. Drop a cookie in the chocolate upside down, flip with a fork, and then lift it out with the fork and give it a few taps on the side of the bowl to even out the chocolate and let excess drip off. Scrape the fork and bottom of cookie against the edge of the bowl before placing it on the wax paper. Top with sprinkles and repeat with remaining cookies. Let dry completely.